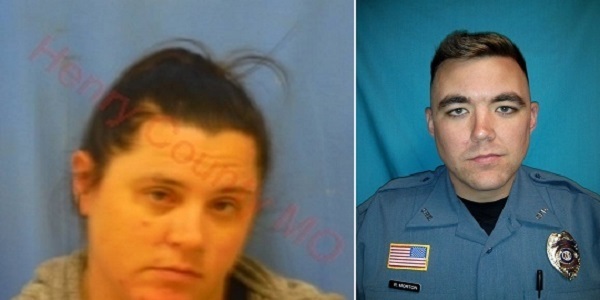 A fatal mistake involvng the wrong address led to the murder of officer Christopher Ryan Morton from west Missouri after he responded to a 911 call about a disturbance that happened some 20 miles away, in another town. Five officers responded to the call and arrived at the rental home of the woman - Tammy Dee Widger, 37. She opened the door and told police there was no disturbance. Officers proceeded to enter the home to make sure that no one was hurt, and that is when gunfire started. The shooter was James Waters, also inside the house, and when police arrived at the scene, they found both him and Morton dead on the floor. Police arrested Tammy Dee Widger and eventually she was charged with second degree murder. According to records, the murder charge was added due to Widger's substance abuse and because Morton was killed “as a result of” of her drug crimes. She had been previously charged with possession of methamphetamine with intent to distribute and with keeping or maintaining a public nuisance, and as of now she has no public defender. Investigation about the mistake with the address is underway as Widger remains under police custody. Learn more about the Michigan judicial system. Find out how the judicial system in Michigan operates! Learn more about the Virginia judicial system. Find out how the judicial system in Virginia operates! Save Snapchat Videos Easily with this Guide! Should I Run a Background Check on My Online Date?